1 5/8” to 2 1/8” (41mm–54mm) standard including Vandlgard® functions. 2 3/4” (70 mm) standard. 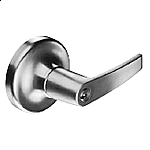 Steel, 1/2” (12mm) throw, deadlocking on keyed and exterior functions. 6-pin Everest C123 keyway standard with two patented nickel silver keys per lock. Seven-year limited for all functions including Vandlgard.